Consider the numbers: Ten milligrams of THC in a cannabis product is a hefty dose for a naive patient and sufficiently psychoactive for the occasional recreational user. Ten mgs of THC combined with an equal amount of CBD in a Sativex tincture hit the analgesic sweet spot in clinical trials. These are moderate doses compared to the amount of single-molecule CBD administered to epileptic children in clinical trials – up to 50 mg per kilogram – with CBD doses as high as 2000 mg not uncommon among patients who obtain CBD isolates from internet storefronts and other unregulated sources. 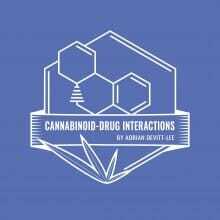 CBD also interacts with THC. By taking CBD and THC together, individuals may find that the effects of THC are tempered but prolonged slightly. It is known that 11-OH–THC, a THC breakdown component, is more potent than THC at the CB1 cannabinoid receptor, which mediates psychoactivity. 11-COOH–THC, another THC metabolite, has anti-inflammatory effects without causing a high.